7 Tablespoons Ultra Premium Chiquitita Extra Virgin Olive Oil or any other good EVOO. 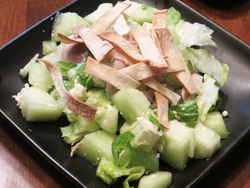 Combine romaine, chicken, honeydew, queso fresco, and pumpkin seeds in a large bowl. Whisk together lime juice, chile, salt, pepper, and remaining 1/4 cup oil in a small bowl. Drizzle over salad and toss to combine. Top with crispy tortilla strips and serve.